Beautiful rug of high quality ~ a bit more White than I had wanted but still very pretty. Effortlessly capturing the charm of vintage Oriental motifs, this 9' x 12' rug from Safavieh's Evoke Collection is a marvel of modern artistry. This fashion-forward frieze rug features a grey field of color with shades of turquoise, royal blue, and ivory. A stunning display of elegance, this piece emulates the appeal of a rare heirloom. The rug is nice and plush. My problem is that the color description is a bit off. I see more blue and teal rather than the grey. Zoom in for a better look. I would have preferred more grey. I've attached a picture. The rug looks as pictured. The distressed vintage look makes it both formal and modern. The colors are: ivory, blue, gray, and black, with the rug being predominately ivory and blue. 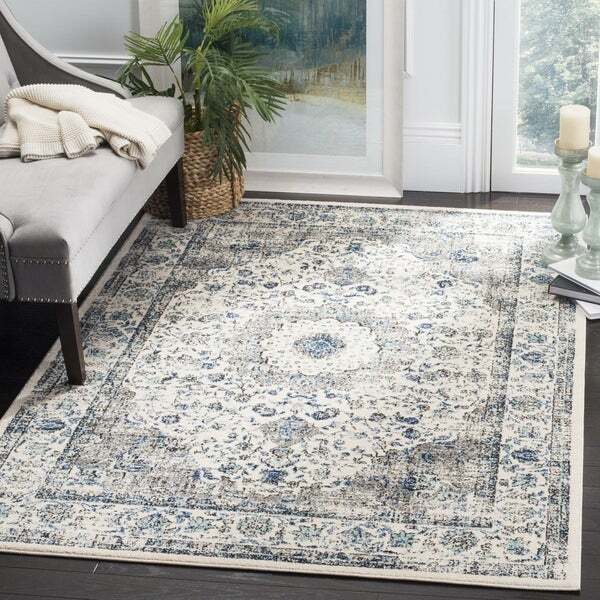 I was hesitant to buy a rug online b/c I am very picky and was nervous about having to return it if I didn't like it and I hadn't seen anything in the stores that "spoke to me". When I opened this rug I immediately thought that if I had seen this in a store, I would have thought, "Yes, this is it!". It's absolutely beautiful and is even more beautiful in person. I was nervous about the gray lines I saw in the pics online but in person they are not lines but just a part of the dark gray pattern. We are redoing our kitchen and family room and this rug is going in our family room. We have a dark gray couch with pale oak colored walls. Because this rug has blue, teal, turquoise, and gray...you can choose any of the colors to accessorize with. From the other reviews some ppl said it was more blue than gray but I don't think so. I think it is the perfect combination of both. Not too much of one color. We are working with a decorator who chose this rug and boy am I glad she did!! Plus the price is right and it's soft and durable! I couldn't love this rug more!!! This carpet is being used in a bedroom of a vacation home that sits on a lake . 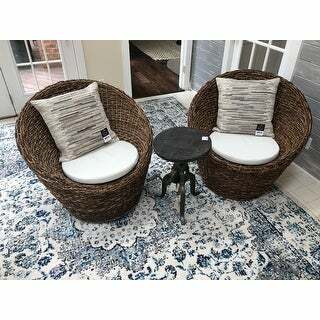 It is a perfect addition to the shabby chic look of the room. The colors are as depicted in the picture and the slight sheen adds to the vintage look. We really love the look, very muted and vintage looking. The quality is as expected, very soft. As usual the delivery was quick and the rug arrived in good shape. We are on hundred percent satisfied with this purchase. The Vintage Shabby Safavieh Evoke Annabel Rug is simply amazing! The fit was perfect for the area and is made of quality, thick material. Our children love playing on this rug, as well as the beauty for the decor in the spot we chose to put it. We plan to order another one for a different room. We are very pleased with the quality of this rug and service! This rug is beautiful! I love Safavieh rugs anyways, and this one certainly doesn't disappoint! The gray color in the rug is subtle, as is the turquoise and blue (almost as if purposely faded out) Very shabby chic! Love this rug!! The colors are beautiful makes a great statement to a room. Plush for the feet. Recommended to others. 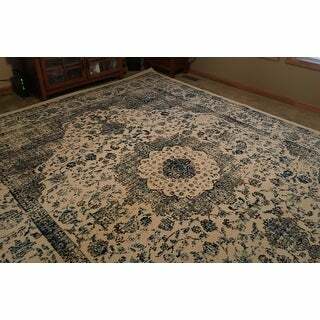 I'm also going to buy the safavieh ivory/blue vintage rug for my dinning room. Beautiful, soft rug. Colors are accurately captured in the photos. Only complaint is the size- ordered 9x12 and rug measures 8’9”x12’. Other than that it is perfect! This is a nice rug, but it should not be considered grey. Although there is some grey in it, the majority is Ivory. I also thought there were multiple shades of blue, but there are only two...turquoise and royal blue (and a little black too). It really looks nothing like the photo, which may be a cause for return. The colors may not work for me. Nicely made, low-pile rug that doesn’t shed. Very good value! Colors are true to the pictures. This rug is a cream color. The blue is a royal blue, not navy blue. Exactly as pictured. A modern take on a traditional rug. Works well in my space. I love this rug! The colors are sharp and beautiful. There is more teal than I expected but it was a pleasant surprise. Only reason it missed the 5 star mark is Bc it was a little thinner than I would like but still a great find! 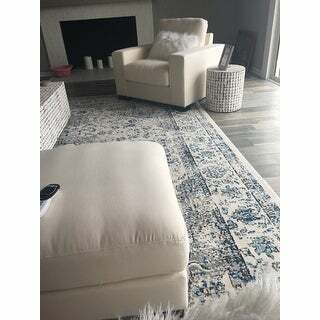 This rug is a perfect fit for our living room it’s clean and crisp colors just make our room pop. The size is great for our room. It came pretty fast. We love it! Beautiful Rug But Wrong Size (TWICE). 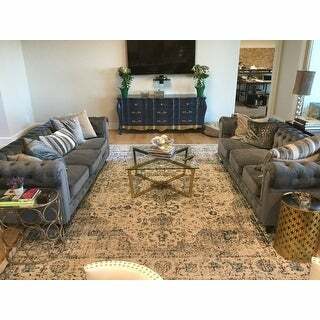 The rug is beautiful and neutral enough to go with any decor, but I've received the wrong size twice. Both times, I have received a 9'x9' instead of 9'x12'. Customer service has been helpful, but overall, it's been a frustrating experience. Ultimately, I decided against having the rug shipped for a 3rd time to avoid having three incorrectly sized rugs sitting in my home. I would be cautious about ordering this size. 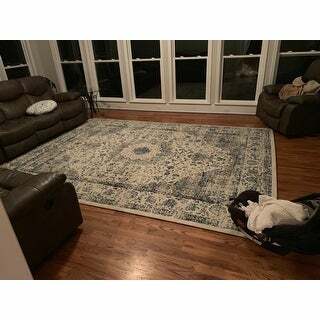 This rug is perfect for our space, the colors are true to the picture and it looks great. I like that there isn’t a noticeable “pattern” to how the design was made to look vintage. The lighter blue is like a sky blue with a hint of teal, the darker blue is cobalt. The accents are a cool grey and black and the background is a nice off-white/cream. For the price, this can’t be beat! So happy with this purchase! Nice quality... I actually like that it's not too thick. Looks very nice with my darker wood floors. Beautiful rug! Looks great in my new home! The blues in this rug certainly pop more than in the o.co photo. It is not as muted as it appears. That said, it's an interesting piece and will work out nicely in my sunroom, where it will likely fade over time. This is the second time I purchased this rug. I also ordered it in a size 8X10 for my dining room. I love it that much! It is soft on your feet yet not too thick where it becomes hard to clean. I am not a fan of shaggy rugs for this reason. I think it will hold up nice with my 2 year old and 2 dogs. This rug looks so good in person! The colors are even prettier than in the picture. 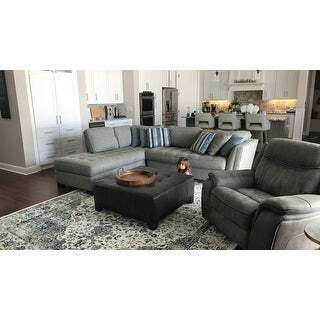 I highly recommend this rug and I know you won’t find it at a better price than overstock because I did shop around but overstock always has the best prices. "Can you put this rug on vinyl flooring"
This rug can be placed on a vinyl floor. We recommend purchasing a non slip rug pad to keep this rug in place as well as prevent scratching to the surface. "Does this rug come in a 2 x 12 runner"
"Do you have it in 7/9"
This rug does not come in a 7 x 9 but does come in a 6'7 x 9'. "Was size you received exact. (ie: 9x12 measures as 9x12). 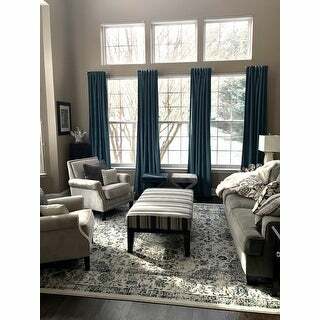 I've run into this issue with other area rugs, but can't seem to find exact measurements on these." "How easily does it spot clean? We have three little ones and while I love this I am afraid it will look dirty all the time. " 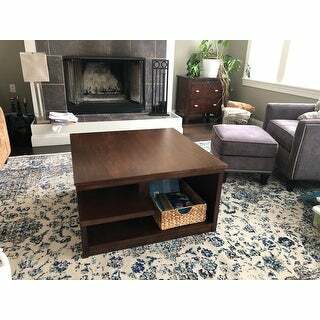 Hi I have the big one, it’s actually too big for my place but I made it work... it’s really nice and elegant looks... also made my mini room spacious because of the combination of the colors, I have a dog and occasionally we have accidents but I find it easy to clean... I don’t wear shoes inside the house so I kept it clean and still looks new... maybe it’s not good if you put it in an area with busy traffic and if you guys wear shoes or sleepers indoor then that’s a different story... but so far it’s working for me. Hope this would help you. The colors help it hide dirt and while I don't have small children, the fact that large dogs can run across it without causing obvious "dirt marks" is great! The rug is really pretty and looks great in my room. Spot cleans well. I have dogs and it seems to be holding up fine. I have four of these rugs. "what is the weight in pounds of the 9 x 12 and the 8 x 10 thank you"
I didn’t know the exact lbs of mine, but I remembered it was heavy really... I had a hard time putting it on my small area, it’s big for my small living room... and it’s kinda hard to maneuver it but it’s worth it... it looks good on my place. "What’s the best way to clean this rug?" We advise not to throw our rugs into a machine washer and recommend all Safavieh rugs be professionally cleaned. Machine washing can lead to damages in the knots and fabric. I don’t know. Just purchased this in August. Haven’t needed to clean it yet. I will probably get a professional carpet cleaner when needed.